Despite being first run back in the early 80s and included in the guidebook in the mid-80s, the NF Molalla has languished, locked behind logging company gates, in relative obscurity for decades. While other runs in the Molalla drainage like the Table Rock Fork and the 3 Bears section of the main Molalla have become boating standards each winter, the NF has remained a bit of a mystery with very few descents, if any, each year. For those that have figured out the access logistics, the NF is a surprising treat, providing outstanding whitewater, exceptional scenery and interesting geology not found elsewhere in the Molalla area. Get warmed up before you put on the river as there are only a few hundred yards of paddle strokes before the hardest rapids of the day begin. Tight and steep, this first section drops 200 fpm through a variety of boulder gardens and small ledges. 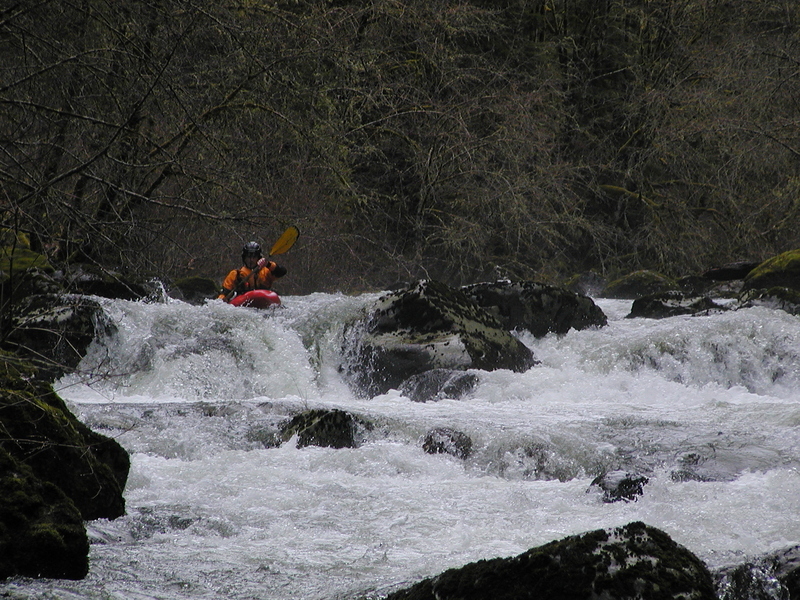 One of the hardest rapids on the run comes up quickly at the first island. The right channel drops over several steep steps before joining the left channel and continuing downstream. The left channel is easier to negotiate. It is difficult to scout in this section so choose carefully where you want to be. After the two channels come together there are a series of fun, small ledges before boaters come to the next island. Here the right channel is small and woody while the left channel drops steeply through a boulder jumble. It is easy to portage the steepest section of this rapid on the left. Below this island the rivers grows wider but the rapids continue, generally steep boulder gardens that are difficult to boat scout but always have a clear line through. Calmer sections of river appear in between the rapids and the scenery gets more rugged with several small gorges. There is a river-wide 5' ledge in this section with several possible lines including an easy boof on the right. In 2017 there wasn't any wood to worry about but wood anywhere in the first mile or in any of the steep boulder gardens downstream could be dangerous. It is difficult to get current beta on hazards so scout often. From the junction of E. Main St. and Hwy. 211 on the east side of Molalla, OR, travel south on Mathias Rd. about .2 miles and turn left on Feyrer Park Rd. Follow Feyrer Park Rd. approximately 1.7 miles and turn right on S. Dickey Prairie Rd. immediately after crossing the Molalla River. Continue on S. Dickey Prairie Rd. about 5 miles to the bridge over the NF Molalla. There are a couple small places to park around the bridge or boaters can continue downriver to the Cedars Day Use area where there is additional parking. Currently, access to the NF Molalla requires a permit from Weyerhauser. It is technically possible to access the river from the backside along Lukens Cr. but it's a loooong drive. This one requires some mapwork. If you've done your research it's pretty obvious how to get up to the putin. Be aware that the most direct route using Lais Rd. trespasses on private property. Generally 2500-4000 is a rough correlation for good flows on the NF. However, the NF could be higher or lower depending on rain patterns so take a look from the bridge at the take-out if the flow is high at the takeout the top section of the run will be Class 5.